Fresh coffee was the routine, and it arrived without fail after every morning dive, as one of the perks of being on board a true 5* liveaboard. So would MAX EATON‘s cup be running over? Haleem with an eagle ray. LUXURY IS A STRANGE THING. I’ve never left a liveaboard disappointed by the standard of food or the service. However, the Four Seasons Explorer is a different beast altogether. Whether it’s being presented with a morning espresso while the dive-team change over the tanks, or lunch menus of lobster and wagyu beef, you quickly become accustomed to a level of service that previously might have made you uncomfortable. The Explorer is a beamy catamaran capable of carrying up to 22 divers. This design allows it to be speedy (it’s claimed to be the fastest liveaboard in the Maldives). But it also has more subtle advantages, because all the cabins are well above the waterline, with large panoramic windows. The diving takes place from the familiarity of a traditional dhoni. 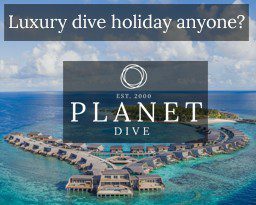 Rest assured, this is not a gin palace and has a fully featured dive-deck with nitrox compressor, an essential feature for the deep repetitive dives of the Maldives. Key of course was also the excellent all-Maldivian dive-team made up of Haleem, the onboard videographer, and dive-guides Moosé and H2. H2 does appear on his official name badge, so Hassan’s trendy mononym has clearly stuck. The itinerary starts at the Four Seasons resort at Kuda Huraa, a 20-minute speedboat ride from Male, moving north to Baa Atoll, collecting or dropping off guests at the Four Seasons second resort at Landaa Giraavaru, then heading into Rasdhoo and Ari Atoll before returning to Kuda Huraa in North Male Atoll. On offer is a full seven-day cruise, or three- or four-night cruises between the two resorts. Our check dive was at Helengeli, a traditional Maldivian dive with a steep sloping reef down to a sandy bottom at 30-40m. We were greeted by a pair of shy whitetip sharks and a large Napoleon wrasse. The reef life was vibrant but the coral was still clearly in the phase of regeneration after the last mass bleaching in 2016. AFTER A MORNING DIVE we began our transit towards Baa Atoll. I had discussed the weather with numerous people before departing and had been assured that the south-west monsoon would result in only slightly more rain and occasional heavy seas. But with this transit crossing the main deepwater channel that roughly bisects the Maldives, we were met by a charcoal-black sky and 35 knots of wind on the beam. The Explorer coped with it admirably for the five-hour crossing. Although I have a decent set of sea legs, there’s not much else to do, and I’m not sure how all the Explorer’s glassware survived. Our first dive-site within Baa was Dhonfan Thila, a small reef that allowed us to start at its base at around 30m and slowly circle the pinnacle as we ascended. Unicornfish on top of Dhonfan Thila. There were fleeting glimpses of large pelagics out in the blue, with grey reef sharks and dogtooth tuna flirting on the edge of visibility. 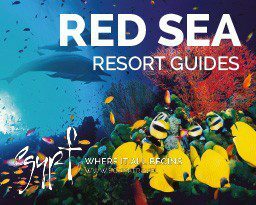 The reef very much comes alive when you reach its flat top at approximately 15m, with an extraordinary amount of fish life. 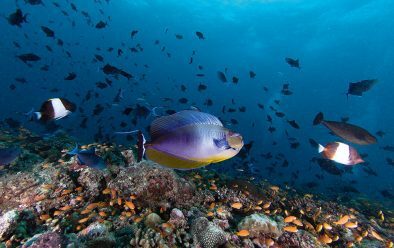 Huge shoals of herring and blue-striped snapper intermingle with the flamboyant colours of the occasional oriental sweetlips and bignose unicornfish. As we moved though Ari Atoll our thila-bagging continued, and Broken Rock hit many of the usual notes. 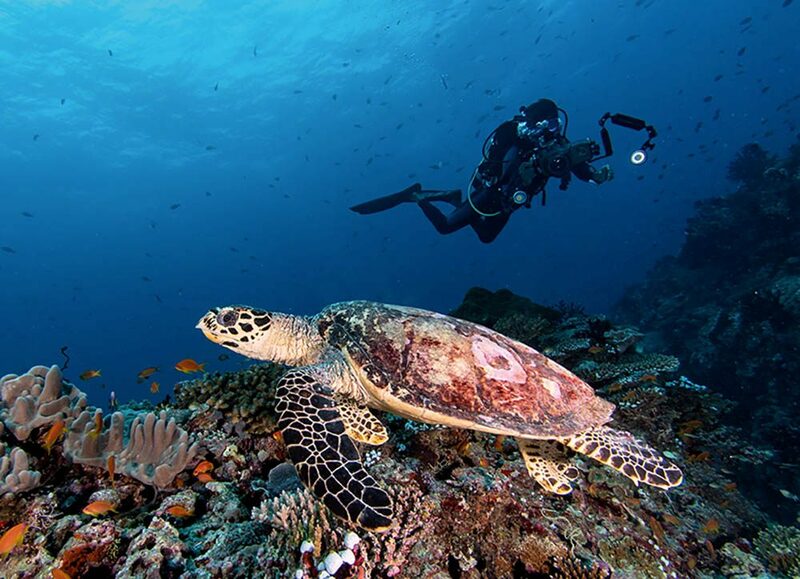 A steep-sided seamount with cracks and canyons adorning its peak, most were wide enough for two divers abreast, and the walls were covered with the best hard corals I had seen in the Maldives. The mount was just shallow enough, and the sky just clear enough, to allow the beautiful pastel shades of the gorgonians to come out. Two hawksbill turtles swam around lethargically on top of the reef above our heads as we enjoyed the swimthroughs. 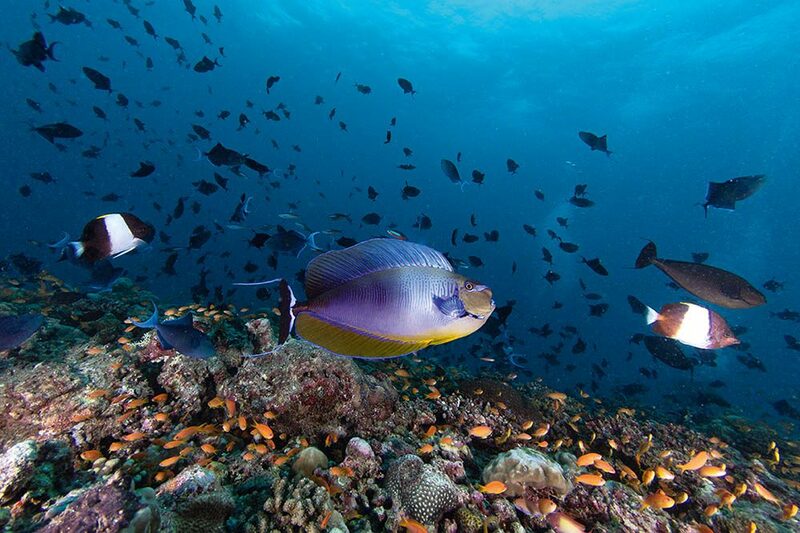 Kandooma Thila gave us one of those small chance encounters that instantly make a dive memorable. As we descended through the water column we were whipped by a strong current, and when the group had all eventually made the thila we began to organise ourselves before continuing with the dive. As usual I was the last to notice two juvenile eagle rays hovering, apparently motionless, in the strong current above our heads. They were both perhaps only a foot across tip-to-tip, and seemed totally unconcerned by the group of unwieldy divers below them. So uninterested were they in us that we were allowed more than 10 minutes with them, as they remained nearly frozen. Their spotted tops are their most recognisable feature but it was fascinating to get a close inspection of their bizarre shovel mouths and impossibly long tails. WHILE WE WAITED at the surface for the dhoni to swoop round to collect us, exchanging pleasantries on what had been an excellent dive, the wind quickly built and we were deluged in a monsoon shower. As fast as the squall arrived it disappeared, and we were back on the dhoni being briefed for the next dive of the morning. 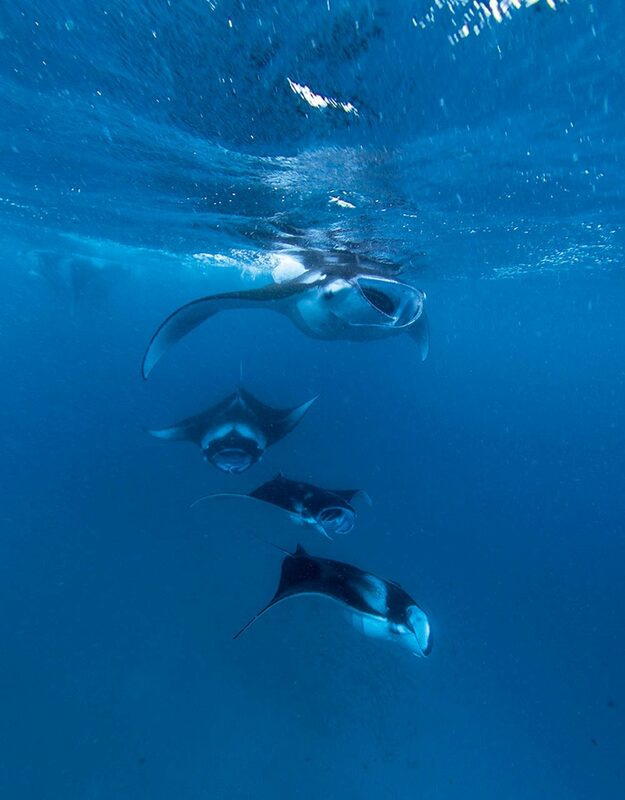 Manta rays at Hanifaru Bay. My calm, methodical manner quickly dissolved into a furious melee of strobes, arms and fibre-optic cables. I was last to calmly slide into the water, to be greeted by a fleeting glimpse of a whale shark dropping away into the blue. 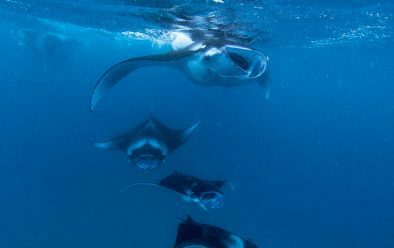 Hanifaru Bay is world famous for its large gatherings of feeding manta rays. The local geography creates ideal condition for the congregation of plankton and therefore an ideal spot for mantas to feed. With the correct tide, groups can number up to 200. A number of our dives had been close to Hanifaru, but our afternoon surface interval was going to be spent snorkelling within the bay. So, after a second dive around Dhonfan, we duly climbed aboard one of the Explorer’s two Zodiacs and headed off. Diving in the bay is now banned, and the number of boats and snorkellers strictly controlled. As we approached we could see snorkellers already in the water surrounded by turbulent water, hinting at the activity below. 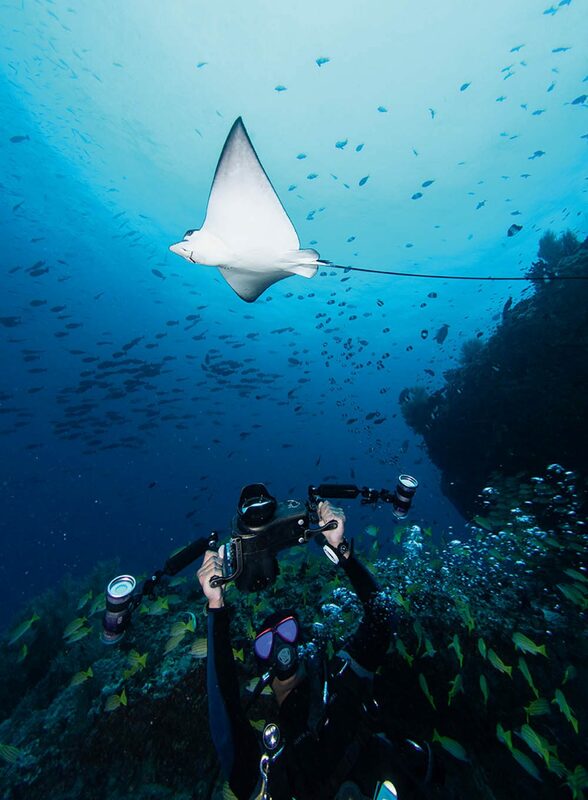 Having spent so many dives in the Maldives and elsewhere willing encounters with manta rays, it was overwhelming to enter the water with no fewer than 20 large individuals. WE HAD BEEN BRIEFED about our positioning in the water, giving the animals room and trying to keep out of their way. After spending 45 minutes in the water with them, the key point that needs to be emphasised is to try to stay out of their way! Duck-diving can be fraught with challenges when you’re unable to get back to the surface because there is a train of mantas overhead. In the rhythmic frenzy of loop-the-loops, barrel rolls and graceful turns, it was difficult to keep an eye on them all. Having left Baa Atoll behind, with a far less dramatic southern crossing of the deepwater channel, we arrived at Rasdhoo Atoll. The dive we had come to do, and stayed to repeat, is called Rasdhoo Madivaru, a well-known shark site that we were lucky enough to have to ourselves for both dives. The ridge of the reef separates the green water of the sandy atoll bottom from the clear ink-blue water of the deep channel. We had positioned ourselves on a slight saddle of the reef, and hooked in looking out into the blue. 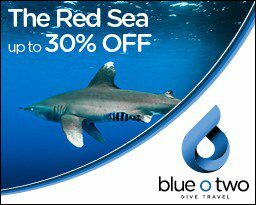 We stayed for 25 minutes watching the constant procession of grey reef and whitetip sharks patrolling the perimeter of the reef. At least 10 sharks were visible at a time, but with clouds of anthias blocking my lens it was difficult to get a clean shot. We finished the dive by allowing the current to push us into the atoll, exploring the inner reef and enjoying a memorable safety stop being accosted by over-friendly bignose unicornfish and batfish. EXCELLENT DIVES FOLLOWED at Fishhead, Broken Rock, Kudarah and Kandooma as we moved through Ari Atoll.These thilas boasted an abundance of reef life but also the occasional exciting visitors, such as hawksbill turtles, eagle rays and whitetip and grey reef sharks. Videographer Haleem with a hawksbill turtle. The Machchafushi wreck provided an interesting change of scene. This artificial reef lies gently listing on a sandy bottom at 30m, close to a reef wall. As we followed the line of the keel forward to the bow, I spotted a perfectly placed anemone away from the vessel, with the silhouetted wreck as a backdrop. I spent some five minutes composing a few shots, keeping a close eye on my computer. We then swam aft, entering the open hold and inspecting the bridge and masts. My greatest concern before going on the Explorer was that it would be a luxury boat that did some diving, rather than an out-and-out liveaboard. 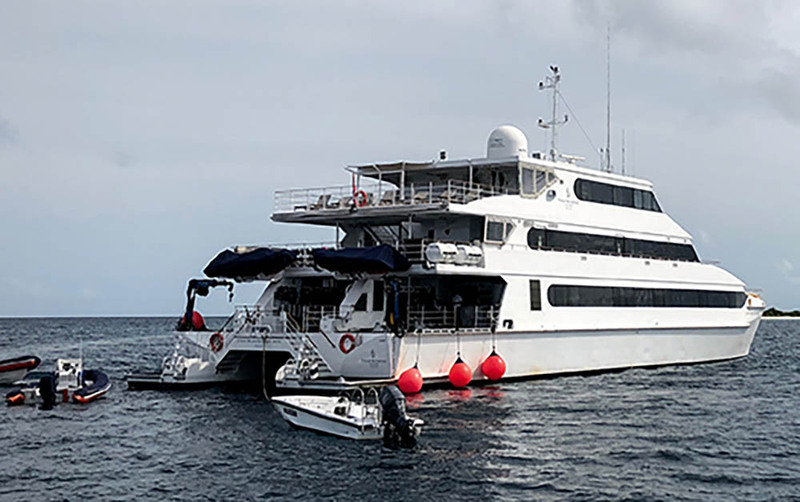 But the boat turned out to be very much a fully fledged liveaboard built around diving that happens to set exceptional standards for luxury and service. In terms of price this might not be the liveaboard you’ll select for your yearly club trip, and compared to other boats it is undoubtedly top-end. However, the Four Seasons Explorer isn’t other boats. 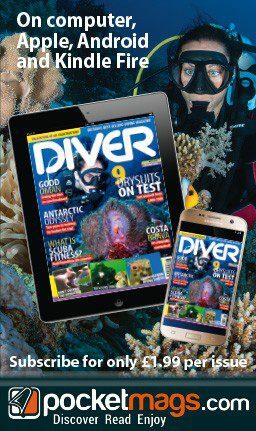 Effortless diving and gourmet food is part of it, but you also benefit from small dive groups, personal EPIRBs and activities including an onboard marine biologist delivering talks throughout the week. The downside of this level of luxury is that it might have turned me into a terrible guest. GETTING THERE> Year-round flights to the Maldivian capital Male are via Doha, Dubai or Colombo. From Male it is a 20-minute speedboat ride to board the Four Seasons Explorer. WHEN TO GO> Year-round. December-April is the dry season and May-November experiences the south-west monsoon with increased rainfall and heavier seas. MONEY> US dollars, credit cards. PRICES> Return flights from approximately £500. 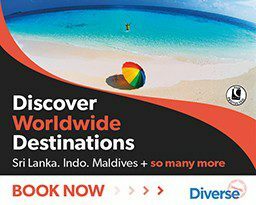 Seven nights on the Four Seasons Explorer starts at US $5950pp but three- or four-night options can be combined with stays at one of the two Four Seasons Resorts in the Maldives.